Schuco is one of the world’s oldest die-cast model car companies, and they were among the first to produce large-scale pieces (1:24 and 1:16, specifically) in the late 1960s. But despite their long history of making high-quality products (focusing almost exclusively on German cars) it seems that few U.S. model car enthusiasts collect Schuco…or are even aware of the company’s existence. First up are the 1:18 diecast models. 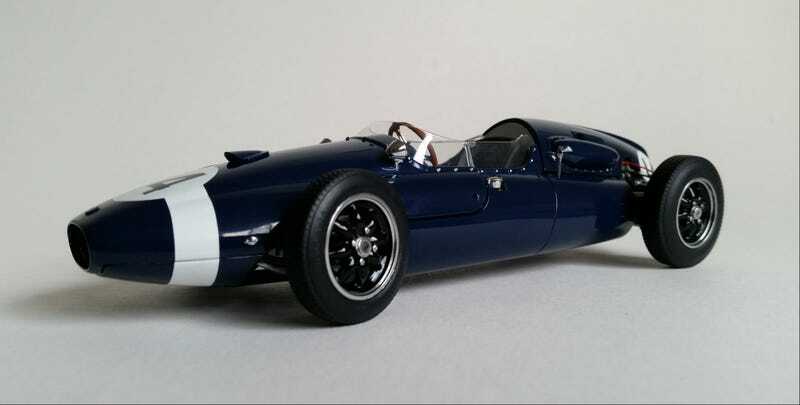 We handled Schuco’s Cooper T51 (pictured at the top) last year, and we loved the detail and old-world craftsmanship it exhibited…if you like your diecast to be heavy, this model had you covered. This year, they’re expanding their already well-known lineup of VW Transporters, including examples from three generations of the venerable “loaf.” Look forward to fully opening doors and engine covers, and possibly articulating pop-ups on camper models. MSRP runs from $169 to $199, but as always we try to come in as far below that as possible. Other intriguing 1:18 diecast models coming from Schuco are the Porsche Cayman GT4, and the big Mercedes O3500 bus, priced at $159 and $259, respectively. Despite their die-cast tradition, Schuco is also moving into the resin realm. Of particular interest among their 2016 1:18 resin releases is the 1972 BMW Turbo concept, with an MSRP of $199. As usual, expect a sealed body…but what a body it is! 1:43-scale diecast is Schuco’s bread-and-butter. This year, they’re releasing a pair of German sports car legends: the Porsche 911S and BMW 3.0CSL. They’re also doing the current-generation Mercedes S-Class in a very dignified shade of grey. We anticipate pricing around $45 on these metal-bodied models. Schuco’s 1:43 resin line will include some intriguing movie cars this year, including the Jaguar E-Type hearse from “Harold and Maude” and the Chevy Blazer Amity Police Department from “Jaws.” MSRP on these is $99…frankly, I think it’s a little steep for these and will try to do a lot better on that price if anyone is interested. Lastly, and perhaps of greatest interest to the LaLD community, Schuco will be doing a line of premium 1:64 cars. We like the Mark I VW GTI, Porsche 356 Carrera 2, VW T3 and Mercedes Strich-Acht the most. Pricing should be around $12 each. What do you think? Let us hear your opinions! We’ll be looking to place our Schuco pre-order by the end of this week, and I’d love to get your feedback. Thanks!